The 23rd Biennial Australian Trefoil Guild Gathering was held in the beautiful city of Hobart in Tasmania from 18th to 21st May 2018 and the Theme was ‘Have a Devil of a Time in Tassie’. We were privileged to welcome to the Opening Ceremony and for the Annual Report, The Governor of Tasmania Her Excellency Professor the Honourable Kate Warner AC Patron Girl Guides Tasmania, Girl Guides Australia Acting Chief Commissioner Rosemary Derwin, Girl Guides Tasmania State Commissioner Joanne Folder, New Zealand Trefoil Guild Coordinator Sally Mason and State Trefoil Guild Advisers from each state. There were 198 members from each Australian State and New Zealand, who thoroughly enjoyed the activities offered in the exciting programme which was put together by the Tasmanian Trefoil Guild Organising Committee under the supervision of Chairman Leonie Howard.The tours which were on offer on Sunday to various places of interest were equally exciting to Port Arthur, MONA the Museum of Modern Art, City Tours and Tahuna Tree Top Walk near Huonville. A Singapore Trefoil Guild Event October 2 017. 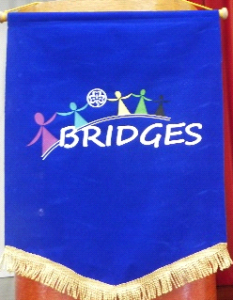 Held to coincide with the 100-year Anniversary Celebrations of Singapore Girl Guides. 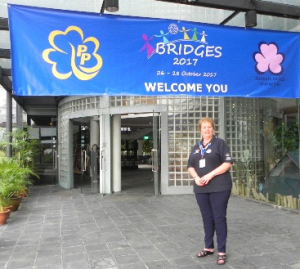 Singapore Girl Guides Trefoil Guild hosted this very special event over 2 days in late October 2017. Eleven Trefoil Members from Guides Australia attended as “Contingent Members” and were joined by 2 Friends of the Asia Pacific WAGGGS; Helen Hargraves and Dallas Langdon. Australia, Japan, Hong Kong, Malaysia, Myanmar, India, Korea, Sri Lanka and Singapore from the Asia Pacific region sent groups. A Trefoil Guild Member from the U.K. and a Girl Scout Leader from G. S.USA overseas unit based in Singapore also attended making it a very international event. A most civilised event with hotel accommodation located in the heart of Singapore and 2 luxury meals at other large hotels, a full day of activities at Singapore Guide House culminating in a wonderful indoor campfire run by Singaporean Girl Guides with great poise and confidence. It was a truly magical event everyone singing and dancing to old campfire favourites all sung in English even though English was really the first language of only one contingent. A half day in the beautiful Singapore Botanic Gardens followed by one of the luxury lunches closed the event. Many friendships were rekindled or new ones formed. Trefoil Guilds in the Asia Pacific are all very much alike, supporting Guiding, having fun and serving their local communities. Only the Trefoil Dress and language is different. A particular high light for me was the Friends of Asia Pacific WAGGGS pinning Ceremony conducted by Australia’s own Helen Hargraves with the founder of the group Juseon Byun from Girl Scouts of Korea actually pinning the membership pins on. I had taken the opportunity before I left Australia of upgrading my membership from Silver to Gold. 5 other members of the Australian Contingent, Jill Jeffrey, Kath Evans, Judy Lyall, and Joan Thom became new silver members following some great promotion of the fund by the members present and received their silver pins from Juseon also. Kay Reeves received her sliver pin as she had not been at a ceremony since joining the Friends Group. This group is working hard to support Girl Guiding and Girls Scouting around the Asia Pacific region of WAGGGS. In particular in Myanmar in recent years. Please think about joining the Friends group the silver membership is 80 English Pounds. Added to the wonderful Guiding content of the long weekend was lots of frantic sightseeing by all the Australians present, Gardens by the Bay both during the Day and at Night, the mandatory Singapore Sling in an under-refurbishment Raffles Hotel. Terrible price but so much fun and so very yummy. A Trip to Changi to view the WW11 Museum, a ride on the Singapore River by Bum Boat, and of course Shopping. What would a trip to Singapore be without shopping. Thank you to all of the Australians for making me the lone Non-Victorian so welcome in the group and for helping to create memories that will last a life time. Given the possible eruption of Mount Agung, the situation was stable at the time the ISGF World Conference took place. Only a few participants cancelled their participation. Volcanic eruptions could result in ash clouds that could severely disrupt air travel, leading to closures of affected airports. On Monday, 9 October 2017 the opening ceremony of the 28th ISGF World Conference took place in Inna Grand Bali Beach hotel in Sanur, Bali. Two hundred and eighty participants (280) from forty-seven (47) countries were present. On Tuesday, 10 October 2017 the Triennial Report followed showcasing the work done by World Committee 2014 – 2017. The workshops to come to an Action Plan for 2017 – 2020 took place. The ISGF World Committee organized a Forum on Intercultural Dialogue in order to define a role of National Scout and Guide Fellowships in promoting dialogue within and between cultures, ethnics and religions. During this day Zambia, associate member since 2011, became full member and four new National Scout and Guide Fellowships obtained ISGF full membership: Nepal, Qatar, Turkey and United Arab Emirates. On Wednesday, 11 October 2017 the World Conference elected for three new World Committee members: Mario BERTAGNOLIO, Zalillah MOHD TAIB and Elin RICHARDS. On Thursday, 12 October 2017, it was the excursion day. On Friday, 13 October 2017 Spain, the only candidate for the next World Conference, was chosen as the next host of the 29th ISGF World Conference which will take place in 2020 in Madrid. Ghana, the other candidate, withdrew his candidacy. There was also the final session of the workshop dedicated to conclusions for the formulation of recommendations and approval of the Bali ISGF declaration. To read more about the ISGF conference please click on the link HERE. 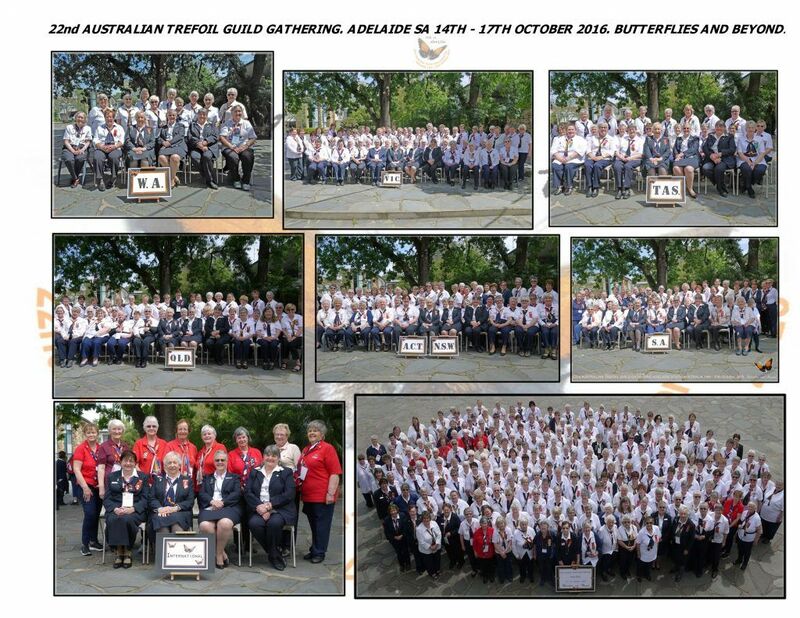 To read the report from the Australian and State Trefoil Guild Advisors meeting held at Camp Chapman in October 2017, please click HERE. The Gathering in Adelaide was a great success and many friendships were forged and old friendships renewed. It was wonderful for everyone to have an opportunity to catch up with people who are in different locations around Australia. This is often the only chance some of us have to catch up with friends from other states and areas. We also made welcome some of our sisters from the UK and NZ and had a wonderful time sharing stories with them. The weather was a little threatening now and again but in true Guiding spirit out came the raingear and on we went! The venue for the gathering and the accommodation was very good and we were well looked after and of course very well fed. Day outings were enjoyed; these included, cruising the Murray River on the Captain Proud paddle wheeler, explored Hahndorf and Victor Harbour in the misty, drizzly rain. 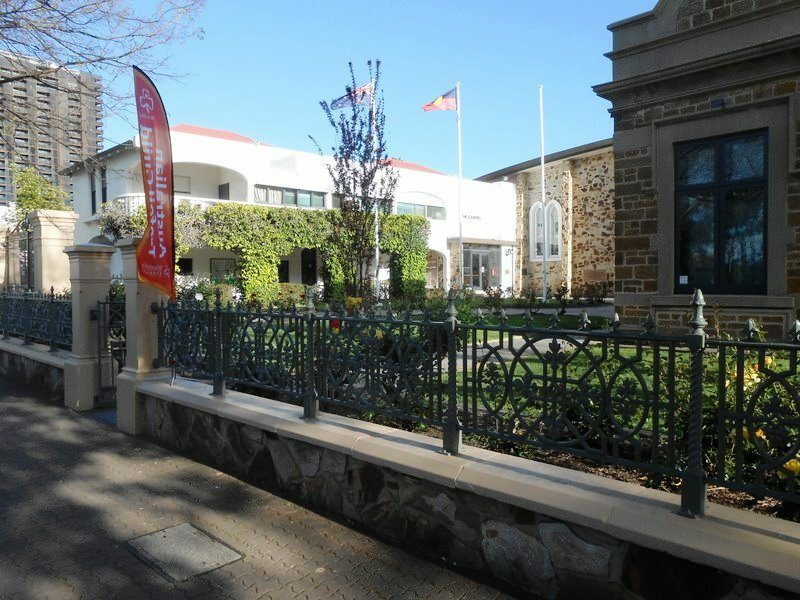 Some people visited the Barossa Valley and others the sights of the Adelaide Hills. Where ever anyone went they all had a fabulous day out. We were entertained by a couple of groups who put their all into their performances. Our keynote speaker on the Saturday morning was Professor Chris Daniels, who spoke about “Why Cities need Nature”. In the afternoon there were many activities like Sophie Thomson from the ABC Gardening Show, who spoke about “Gardening for Health”; this was very popular as was Genealogy but there were several other interesting sessions to select from as well. We were treated with reflections of the year gone past and information about the May 2018 Gathering in Hobart, Tasmania. This promises to be a great event as well but be aware there is limited numbers of 180 so if you don’t want to miss out be sure to put your application in as soon as possible once the forms are released. Thank you to the organising committee who put together the fabulous 22nd Australian TG Gathering and all the work and time they put into making it such a resounding successful weekend. To read more about our Butterflies and Beyond gathering, Cathie Scott has compiled an in depth report on our 22nd ATGG with detailed information. Please click HERE to read the report.